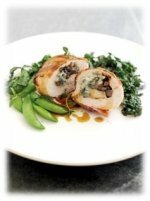 This Traditional Farmfresh Turkey with Gorgonzola recipe puts an Italian twist on the classic Christmas dinner. Filled with chestnuts, cranberries and delicious Gorgonzola cheese, a product of Protected Designation of Origin (PDO), this dish is the perfect addition to your festive celebrations. To make, simply fry the chestnuts and cranberries. Slice the turkey breasts and flatten. Top with Gorgonzola piccante, chestnut mixture and roll the turkey around the filling. Wrap in streaky bacon and roast in the oven until golden brown.